A scene from "Minding the Gap" which won Best Feature and Best Editing at the IDA Documentary Awards. A scene from director Floyd Russ' "Zion" which won Best Short at the IDA Documentary Awards. 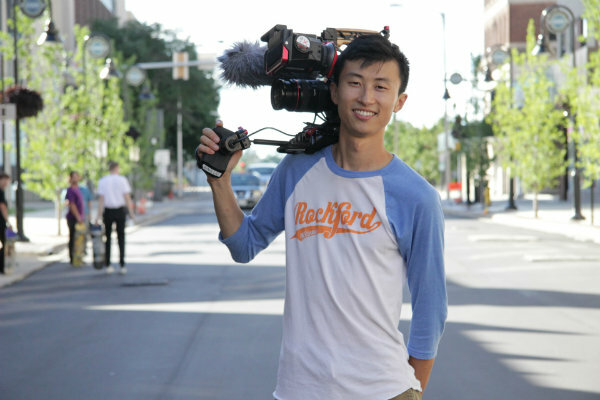 It was a big night for director Bing Liu at the International Documentary Association’s 34th annual IDA Documentary Awards. During a gala ceremony held on Saturday evening (12/8) at the Paramount Theatre in L.A., Liu’s directorial debut, Minding the Gap, won the competition’s top honor as Best Feature. Liu, as previously announced, also won the IDA’s Emerging Documentary Filmmaker Award. And in the Creative Recognition portion of the award proceedings, Liu and Joshua Altman earned Best Editing distinction for Minding the Gap. Minding the Gap tells the story of three young men—including Liu himself—who bond with one another via skateboarding to escape volatile families in their Rust Belt hometown. However as they grow up and adult responsibilities take hold, unexpected revelations jeopardize their decade-long friendship. The poignant film premiered this past January at the Sundance Film Festival where it garnered the Special Jury Award for Breakthrough Filmmaking. After its showing, Liu landed representation for commercials and branded content through Nonfiction Unlimited, a production company known for helping documentarians diversify into the ad arena. On the strength of Minding the Gap, Liu back in May earned inclusion in SHOOT’s 2018 New Directors Showcase. Liu developed the film with Chicago-based Kartemquin Films, and as a co-production of POV and ITVS. He not only directed and co-starred in Minding the Gap but also was its DP, co-producer (with Diane Moy Quon) and co-editor (along with Altman). Liu wasn’t the only SHOOT New Directors Showcase alum to be honored at the IDA Documentary Awards last night. Floyd Russ, who was in the 2016 SHOOT Showcase, saw his documentary Zion win the Best Short Award. The film introduced audiences to Zion Clark, a young wrestler who was born without legs. Growing up in foster care, Clark struggled with fitting in his whole life—until he finds the sport of wrestling, a passion which he pursues, pushing himself to great lengths. Zion was produced by NYC-based The Bindery. And Russ is handled for commercials and branded content through Tool of North America. Among his notable spot endeavors are Ad Council’s “Love Cam” PSA for R/GA, which was nominated in 2017 for a primetime commercial Emmy. Among other IDA Documentary Award winners last night were: Showtime’s The Trade for Best Episodic Series; Netflix’s Wild Wild Country for Best Limited Series; and HBO’s John McCain: For Whom the Bell Tolls which garnered the ABC News VideoSource Award. Finishing in a tie for Best Music Documentary were Mr. Soul! and Matanga/Maya/M.I.A. Earning the Best Cinematography mantle was Shevaun Mizrahi for Distant Constellation. THIS AWARD IS GIVEN EACH YEAR FOR THE BEST USE OF NEWS FOOTAGE AS AN INTEGRAL COMPONENT IN A DOCUMENTARY. THIS AWARD RECOGNIZES EXCEPTIONAL ACHIEVEMENT IN NON-FICTION FILM AND VIDEO PRODUCTION AT THE UNIVERSITY LEVEL AND BRINGS GREATER PUBLIC AND INDUSTRY AWARENESS TO THE WORK OF STUDENTS IN THE DOCUMENTARY FIELD. THE PARE LORENTZ AWARD RECOGNIZES FILMS THAT DEMONSTRATE EXEMPLARY FILMMAKING WHILE FOCUSING ON THE APPROPRIATE USE OF THE NATURAL ENVIRONMENT, JUSTICE FOR ALL AND THE ILLUMINATION OF PRESSING SOCIAL PROBLEMS. The Courage Under Fire Award—which is given from time to time to a filmmaker who demonstrates extraordinary courage in pursuit of the truth—was presented to director Stephen Maing and all the NYPD12 whistleblowers of Crime + Punishment. Amidst a landmark lawsuit over illegal policing quotas, Crime + Punishment intimately observes the real lives and struggles of a group of black and Latino whistleblower cops and the young minorities they are pressured to arrest and summons in New York City. Over four years of rare access, the film cinematically documents our nation’s largest policing institution from the inside through the efforts of a brave group of officers who decide to sue the department and became known as the NYPD12.